Ligustrum ovalifolium/Privet bonsai I re-styled in early June 2017 after my son Jake had defoliated it for me, its deadwood treated with Superglue (Cyanoacrylate). In development since 2010 after being dug up from an old hedge, some of the deadwood on the Privet bonsai in the image above had become very soft and fragile over the course of 7 years. This can be common with tree species that have naturally soft-wood, particularly Privet/Ligustrum species. A few weeks prior to the re-styling, I carved out the very soft and pulpy wood on the tree, and took the opportunity to improve on my previous work. After staining the deadwood (using the ash and lime-sulphur technique), I hardened it to stop it rotting again in the future. 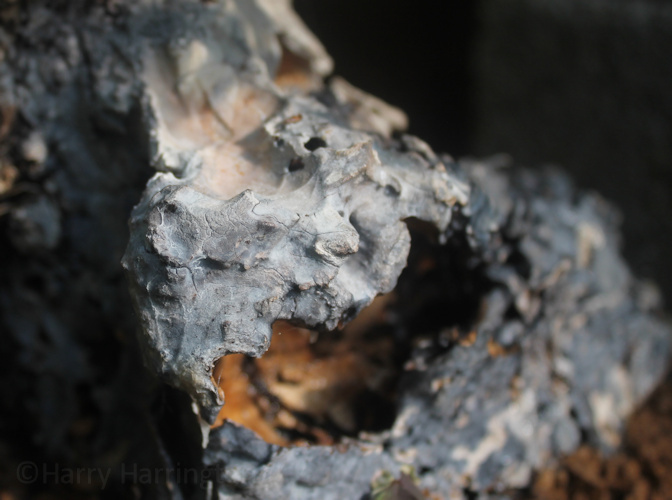 In previous years I have used 'wet-rot hardeners' to harden deadwood and prevent it rotting. This is often sufficient to ensure that the deadwood remains stable. However, particularly where the deadwood is in continued contact with the soil, some areas can still become very fragile over the years despite the use of wood-hardeners. Earlier this year a fellow enthusiast advised me to try using superglue (also known in some countries as Krazy Glue) to harden the wood and the results have been fantastic. I really wish I'd known about this technique a few years back, as it makes even the weakest, most fragile wood, rock hard. Using superglue liquid, not gel, the superglue is applied when the wood is as dry as possible. If necessary, first use a small gas blowtorch to drive out any moisture that remains in the upper layers. The superglue is carefully dripped over the deadwood and it soaks straight in, in the same way that wood hardener does. Keep dripping the supperglue into the wood until it becomes glossy showing that the wood is fully saturated (as with wood-hardeners). The superglue takes a short period of time to harden off; it can then be wire-brushed to remove the gloss finish, as necessary. Superglue works by a chemical reaction that occurs when it comes into contact with water or moisture in the wood, or humidity in the air. Use of superglue on wood that is wet or damp on the surface, will cause the glue to harden on just the upper layers and can create a shallow, opaque-white surface. For this reason, if at all possible, I would advise using this technique during the warmer Spring and Summer months while temperatures are 10C or above, and the deadwood is typically drier, allowing the glue to permeate deeper into the wood. Although I wouldn't advocate getting any glue onto live roots (!) generally-speaking, any run off of surplus glue into the soil , does no harm and its spread is very limited. Deadwood on an Olive bonsai. The wood was first stained until I had achieved the colour I required, before I applied a large amount of superglue to harden it. The wood has not been wire-brushed; although there have been occasions where the superglue has left an unnatural gloss appearance, it seems that this maybe the exception rather than the rule. Note that the liquid superglue does not interfere with the natural appearance of the grain, the minute fissures in this very old yamadori Olive deadwood are still clearly visible, . 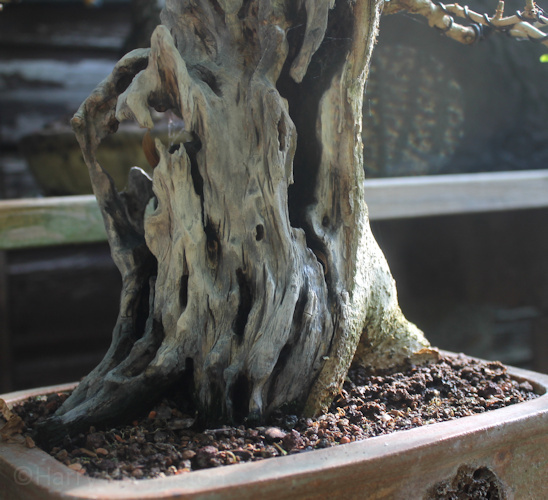 Newly carved and stained deadwood on an old Ligustrum/Privet bonsai that had first been hardened with superglue. 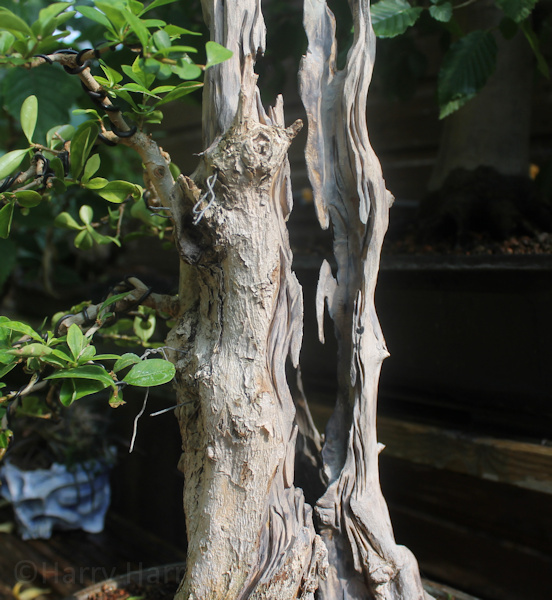 The deadwood on this Privet bonsai had become so fragile that ordinarily it would not have been possible to carve it. The sheer force of cutting tools mounted to a carving machine would have ripped the wood apart. However, a prior application of superglue made the wood so strong that I was then able to re-shape it at will, creating very thin and delicate panels of wood. I found that with the wood already hardened with glue, the black water-based ink I use to darken the hollows simply ran off the surface of the wood. However, the applications of ash and lime-sulpher still achieved the colours and tones I required. My conclusion here is that although it is preferable to carve and stain the wood before hardening it (with superglue), it is not absolutely essential if circumstances won't allow it. Another carved and stained deadwood piece on a Privet bonsai, newly hardened with superglue. The chemical name for Superglue (or Krazy glue) is Cyanoacrylate. It is an acrylic resin that rapidly polymerises in the presence of water (specifically hydroxide ions). Gel-type superglue products have the addition of silica or even rubber to slow down the curing rate and increase the viscosity of the glue. Personally I would avoid the use of these gel-products as they do not sink into the deadwood as is required for our purposes in bonsai. The ability of Cyanoacrylate (superglue) to resist water seems to make it popular with marine aquarium hobbyists who use it to glue the hard corals onto pieces of live rock. This seems to illustrate not only its water-resistance, but its safe use around living organisms. When added to baking soda (sodium bicarbonate), Cyanoacrylate forms a hard, lightweight adhesive filler (baking soda is first used to fill a gap then the adhesive is dropped onto the baking soda). Be aware that the reaction between cyanoacrylate and baking soda is very exothermic (heat-producing) and also produces noxious vapors. Cyanoacrylates, now sold as superglue, krazy glue, Eastman 910, amongst others, were invented in 1942 by Dr. Harry Coover of Kodak Laboratories during experiments to make a special extra-clear plastic suitable for gun sights. The use of cyanoacrylate glues in medicine was considered fairly early on. Eastman Kodak and Ethicon began studying whether the glues could be used to hold human tissue together for surgery. and submitted an application to use cyanoacrylate glues to seal wounds. Soon afterwards, superglue found use in Vietnam by the military in order to quickly stem wounds in battle.